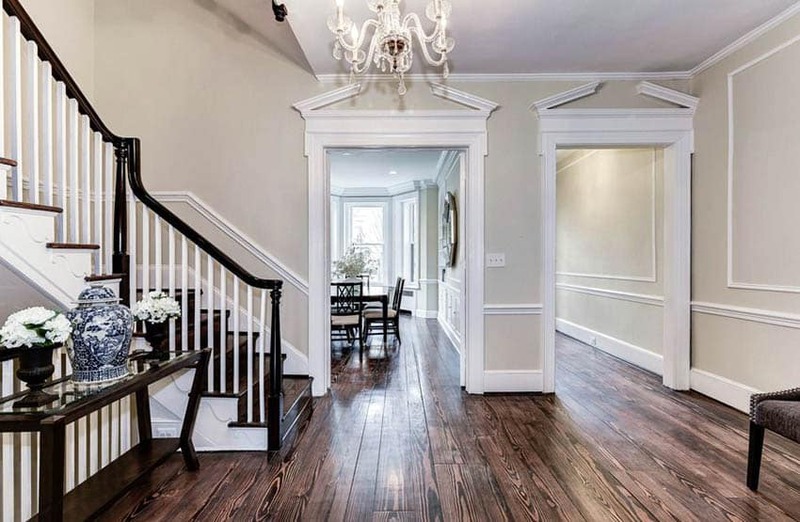 Here we share the best foyer paint colors to make your home stand out and become a welcoming place for friends and family. The foyer isn’t just the place where you drop the mail on your way in the door after a busy day. 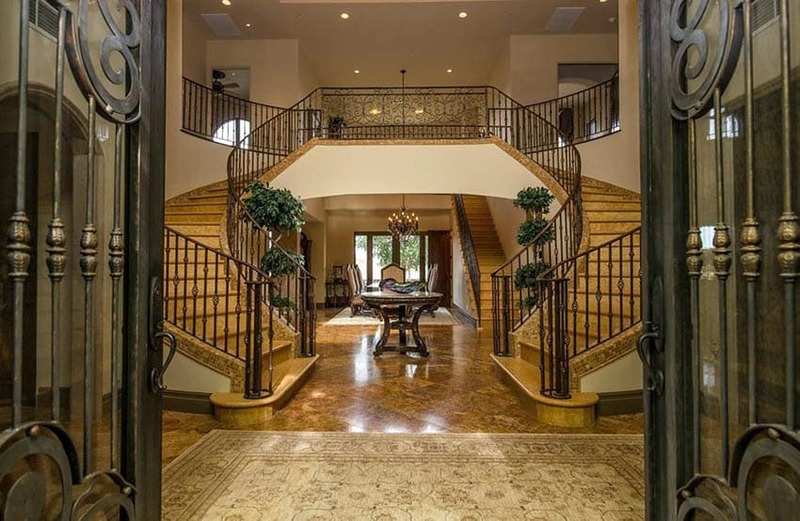 It is the first space that you or your guests see when they enter, the space that says welcome home. Because this space is often small and simply furnished, your paint color will dictate the mood and feel of the foyer and set the tone for the rest of your home. 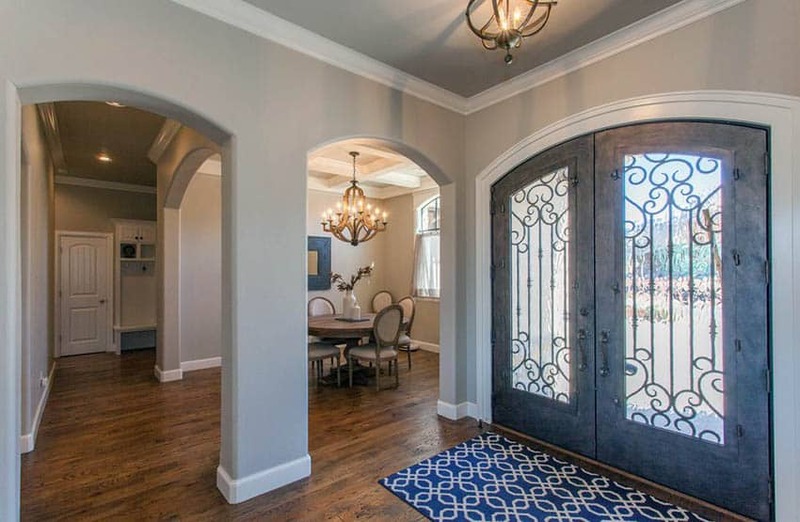 That doesn’t mean that it has to match the rooms adjacent to it, attention to detail and some tips from a designer will help you decide what you want your home’s entryway to say about you. The light and dark of it. Have you ever seen a dark foyer? It isn’t always the most welcoming. But that isn’t the paint colors fault! It is the fault of adequate lighting. If you don’t have any natural light, you want to make sure that your lighting is bright and welcoming. An overhead light might not provide enough light so consider wall sconces or tall, slim table lamps to provide enough light to check your lipstick in the mirror or easily see which pair of shoes is yours as you rush out the door in the morning. 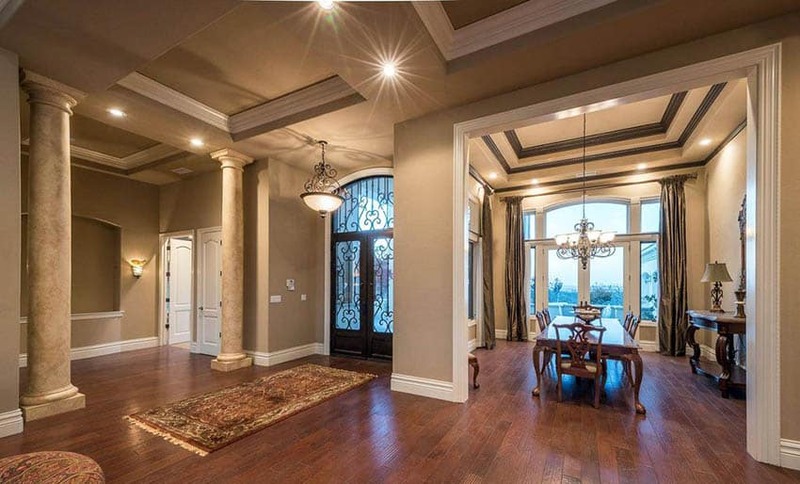 Now that you have good lighting, we can talk paint color. We so often seen light, soft neutrals in foyers, and with good reason. They are easy to work with and are often what was already there so we just live with it, leaving the foyer as an afterthought, once we finish redecorating the kitchen or living room. Don’t just leave the builder-grade paint on the wall. Give your neutral some life! A gorgeous, light grey, or griege (grey and beige combined) like the low clouds of a romantic winter snow, makes your foyer look light and fresh and pairs well with both light and dark furniture. For more drama, use a deeper grey, like the dark clouds of a summer thunderstorm. It is still a neutral but gives your space a little bit more depth and a sophisticated edge. If you just love color, don’t be afraid to go with a bold pop of it in your foyer. 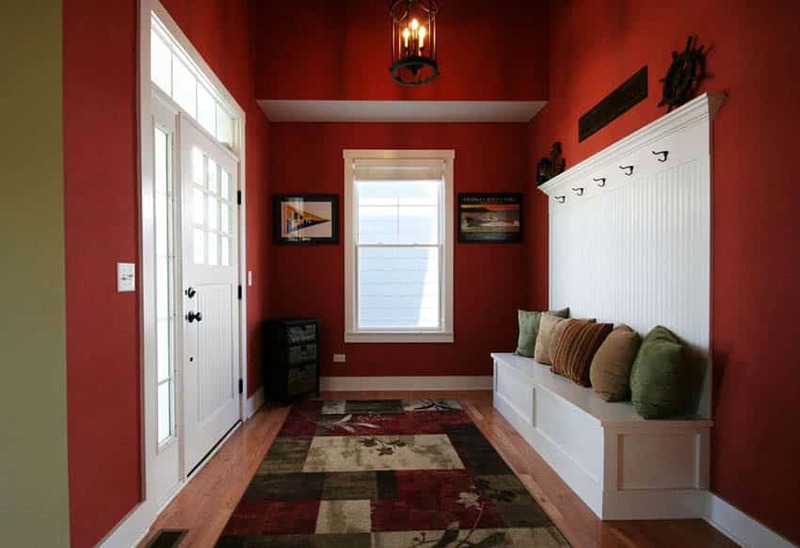 A spicy tomato red, summery coral, or rich, peacock blue are all great colors for your foyer. These colors might be a bit much if you put them in a larger space, but in a small foyer, they provide the perfect amount of punch and personality. Have a little bit of fun with this small space and breathe new life into it with an unexpected hit of color. These bright colors play well with any décor as they transition you from the hectic outside world into the warmth and comfort of your home. Think neutrals are boring but aren’t really a fan of bright colors? A dark color in your foyer allows your mirrors and lighting to sparkle and can make your space appear larger because the walls will appear to recede. If you want something truly unique, that makes a statement, go dark. Dark brown, like melted chocolate, or the rich purple of a ripe eggplant, so dark it is almost black. Deep, rich, edgy, modern but timeless, not trendy but always current. This entry foyer with dual staircase design features a dark wrought iron railing with lighter stained wood steps for contrast. These colors really bring home the ideas of warmth, safety, and comfort. Be sure to test swatches on the wall so that the colors don’t look muddy or dull. And as always, lighting is of the utmost importance so the space doesn’t look like a dungeon. An oversized mirror on the wall opposite the door or a mirrored occasional table really brings the drama home and helps bounce light around the room. 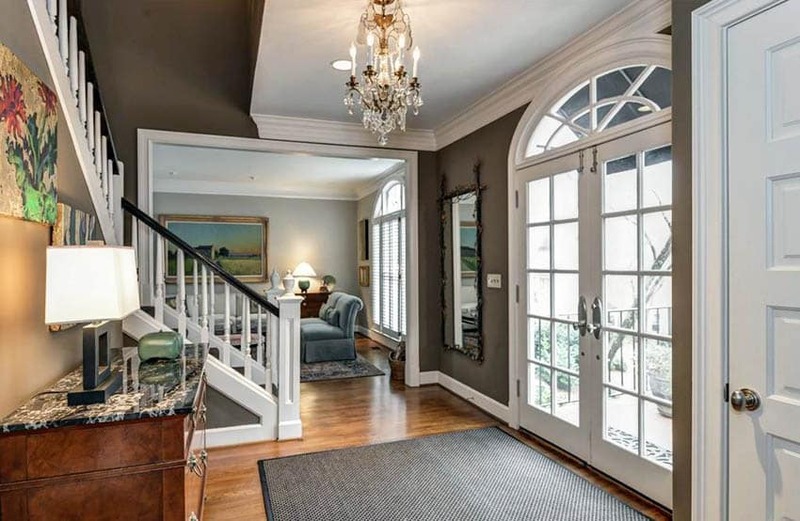 Take it from the designers, don’t overlook your foyer, good design extends to all the rooms of your home! 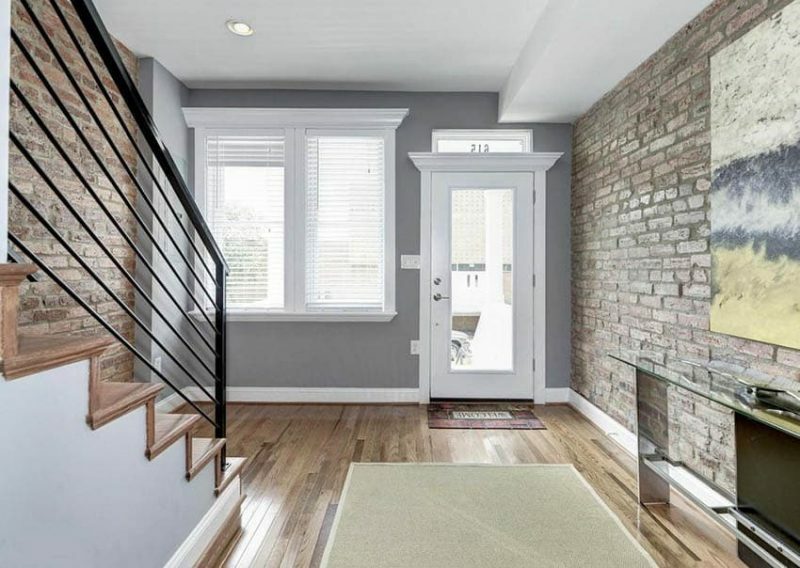 Don’t accept that oatmeal builders-grade paint, go for the luxury of dark, rich colors, the exciting pop of bright color, or the peaceful neutrals to create a beautiful transition from the outside world to your home. Want more ideas? Visit this gallery for even more foyer ideas including a variety of paint colors and design styles.